In the summer, you don’t want to be stuck wearing supportive shoes that cover your entire foot. Unfortunately, you’ve likely been stuck summer after summer in heavy footwear that makes your feet sweat. 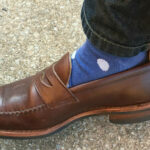 You have to care for your feet, but you want to enjoy a light breeze on your toes like everyone else. 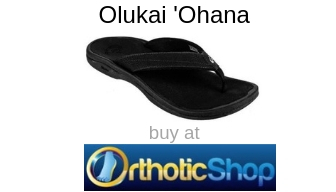 Orthopedic flip flops for men and women can be worn to the beach or shopping. When you purchase a good pair of orthopedic sandals, you’re going to be able to wear them longer and not worry about the health of your feet. Travel with flip flops is much easier, too. You end up with more space in your bags when you’re not packing bulky footwear. 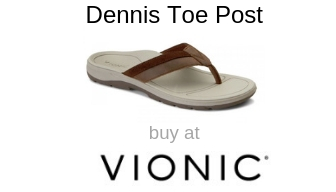 So, since you probably know somewhat what you’re after, we’ve done some legwork for you and researched all of the nicest (in our opinion) orthopedic sandals and flip flops from the following distributors: Amazon, Healthy Feet Store, VIONIC, and OrthoticShop. These are top sellers for men and women and definitely worth a look! 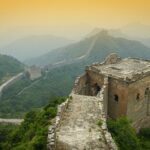 Use the following table of contents to navigate to some of our selections and read more about the product. 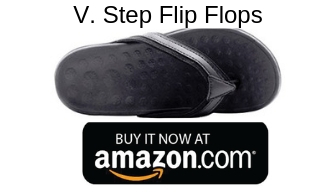 Check out our reviews of some of the best and most popular orthopedic flip flops offered by some of the most well-known online outlets in the country, including Amazon, Healthy Feet, Vionic, and OrthoticShop. 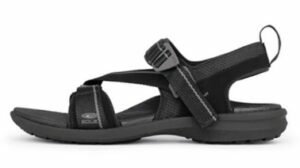 These sandals have a contoured footbed and cushioned heel. They’re going to give you a ton of support for any kind of foot issue you might have. They’re especially good for plantar fasciitis. 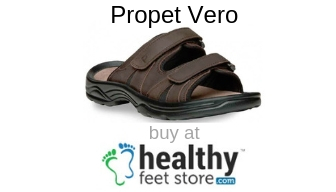 According to Healthy Feet Store, these orthopedic sandals are approved by Medicare. They’re good for women with joint pain and neuropathy, which is nerve pain in the feet. The shoes are well-made and feature great materials like fine grain leather. It has a flexible outsole and adjustable strap for comfort. They come in a variety of colors, sizes, and even widths. You’ll be able to walk in them for hours without discomfort. 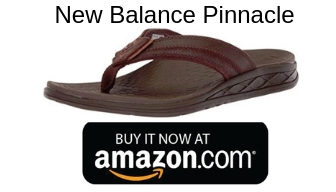 This sandal is good for men with arch or heel pain. 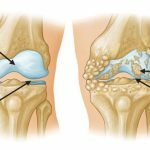 It can work with a number of other foot ailments including arthritis or shin splints. The footbed has a padding of foam for incredibly comfort. The outsole is light enough and crafted to grip the ground securely. If balance is a problem, these sandals won’t let you down. They’re made with full grain leather for the upper. Inside, there’s a lining that will help the slide-in sandals stay on your foot. These may look like casual flip flops you can buy for a few dollars at the local big box store. That’s not the case. These flip flops for women are providing a really thick foam layering. It’s made from memory foam, so it’ll practically hug your feet. 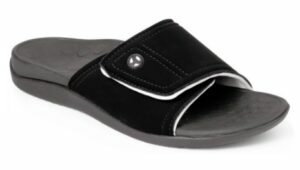 In these sandals, you’ll find a high arch and rubber outsole. It provides plenty of shock absorption for comfortable walking anywhere. 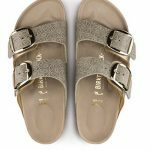 While being supportive and lovely (they come in a variety of colors), the sandals are easy to pack for travel. 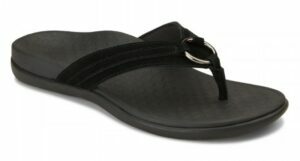 As far as flip flops, these are great sandals that will provide structure and cushioning for your feet. 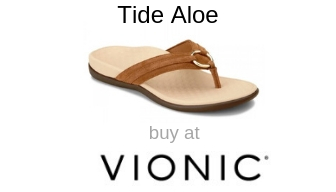 The sandals from Vionic shoes are specifically made to provide comfort for your heels. They’re casual yet very comfortable. Every woman wants a cute pair of sandals for the summer or vacations. These could very well be your favorite cute pair. While being adorable, they’re also functional. It’ll stop you from having foot pain especially in the heel. The EVA midsole absorbs shocks from walking. It has Orthaheel Technology, which cushions your heel. It’ll also alleviate ankle pain from walking. 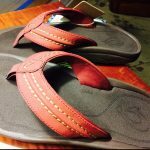 These sandals actually received the APMA Seal of Acceptance for good foot health. That’s the American Podiatric Medicine Association. Another great toe post sandal, but for men. 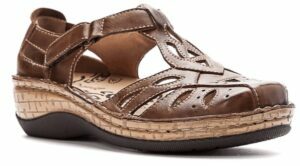 This one has an EVA footbed for comfort while walking. The outsole is a flexible rubber that will be comfortable for hours of walking. It’ll cushion and absorb the shocks from your feet hitting the ground. The Dennis sandal has Orthaheel Technology. It’s meant to reduce overpronation or flat feet. The fact that it’s very supportive means that the sandal’s heel will reduce all kinds of pains from heel to ankle to lower back pain. It comes in sizes from 7 to 13 and medium widths. So far, we’ve featured sandals for men and women. 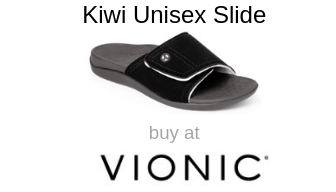 These are unisex slide sandals that anyone can wear. They have a padded upper that closes using a hook and loop. It’s adjustable for personalized use. It has the same Orthaheel Technology available at Vionic. It’s been shown to reduce heel pain dramatically. The heel has the material that will hug your heel. For it’s comfort and orthotics, the sandal has earned the APMA Seal of Acceptance, too. It’s available in sizes for men and women. Women’s sizes range from 6 to 14 while men’s sizes are 5 to 13. It fits medium width feet. 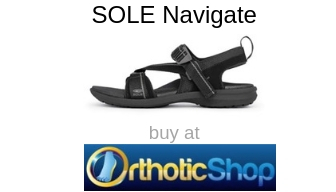 The sandals from Orthotic Shop have incredible arch support. They’re lightweight while still providing superior support for your arches as well as cushioning for your heel. The problem with most flip flops is that they feel insubstantial. These are supportive while still being light and cushiony. 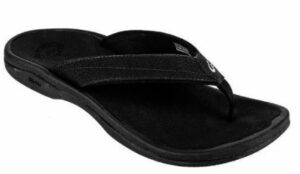 These orthopedic flip flops are made with a midsole that has compression-molded materials. The flexible rubber outsole provides stability for slick surfaces. 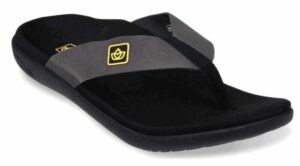 The materials are water-resistant, so this is a great sandal for the beach. 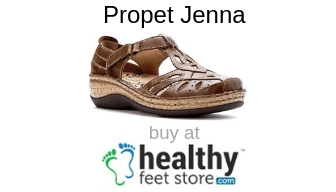 It gives strong arch support and can reduce the pain of plantar fasciitis. The toe post itself is made of a soft nylon that won’t rub or cause pain. It’s a beautiful sandal that comes in 26 colors. You could buy a few colors to match many of your outfits. That’s especially fun for vacations. 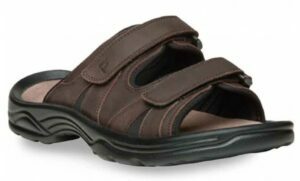 These men’s sandals have strong supportive straps for walking. These look like sandals you could even hike while wearing. Adjustable straps will secure the sandal around your foot without causing discomfort. 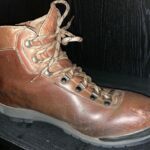 They have a rugged sole that grips the ground securely. The footbed will mold to your feet. It also has a Polygiene Antimicrobial Agent. That will control foot odor if you’re prone to sweaty feet. There’s a deep heel cup for cushioning those with heel pain. These orthopedic women’s sandals have double straps with buckles to close them. They’re placed in strategic locations to ensure a secure fit. 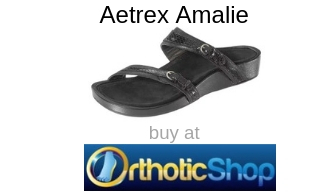 If you have a custom-made orthotic, they can work with this sandal. They have removable footbeds. The removable footbed is covered with suede and memory foam for incredible comfort. The cushioning will relieve many symptoms of foot and heel pain. It comes in sizes 5 through 11. There are a few colors available like all black, black and ivory leather, and moss nubuck. Whether you have toe pain, heel pain, or fallen arches, you shouldn’t have to spend a ton of money on sandals. 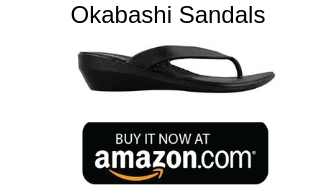 With Amazon, you’re getting good deals as well as stylish shoes. The entire Lakeside flip flop is made of microplast rubber. It doesn’t have BPA or latex in it. The sandal is springy and very comfy. It has anti-slip properties to ensure you’re stable while walking, too. The arch support is where these sandals really shine, though. While it has a heel of approximately 1.75”, it’s a very squishy material that will relieve pressure in the heel. That’s important while also having great arch support. It comes in sizes 5 – 6, medium 6.5 – 7.5, 8 – 9, and large 9.5 – 10.5. It comes in five colors, too. The New Balance name is one most people are familiar with because they make good sneakers. They take some of the same concepts in their sneakers and use them for these flip flops. The uppers are made from leather while the outer sole is rubber. 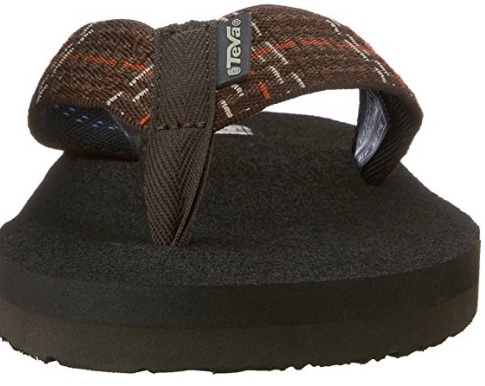 This sandal’s strength and orthopedic nature comes in the footbed and heel cup. It has anatomical arch support, too. It comes in sizes 8 through 15. There are two colors available; black or whiskey. 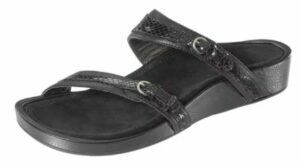 The uppers on this sandal are made of soft materials that allow you feet to breathe. They’re a casual-looking sandal with superior comfort and support. The outsole is made of rubber that won’t slip. 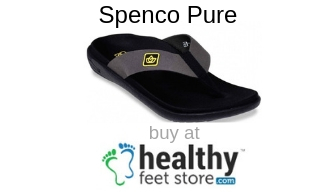 It has stiff arch support that helps with many types of foot pain. From plantar fasciitis to flat feet, it covers many foot ailments. Using the right sandal for your condition has been known to relieve serious pain and symptoms. These very well could be the sandals that work for you. The best orthopedic flip flops for men and women are on this list. You can’t go wrong with any of them. We’ve given you lots to think about, but you should go with the ones that will address your specific foot concerns. Take into account where you’re going to wear them, too. 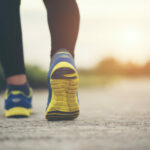 Previous ArticleHow Many Calories Does Walking Burn?